The Department was established in 2014 to meet the aspirations of the students of this region and also to train the students desirous of learning, understanding, teaching and practicing various aspects of plant sciences. Courses were designed to take care of both the classical and contemporary aspects of Botany. Within a short span, the Department earned a name as an important centre of studies in Plant Sciences. The hard work put in by the teachers and more so the students started yielding dividends right from the very beginning. One student from the first batch qualified CSIR-NET - JRF. The department has the expertise and infrastructure to help students opt for getting advanced training in many areas of specialization such as Plant Biotechnology, Plant Physiology, Forest Ecology, Biodiversity Conservation, Taxonomy, Cytogenetics, Mycology, Reproductive biology, Lichenology, and Ecology & Environmental Biology. With the help of grants received from various funding agencies (DBT, MoEFC&C, GBPIHED, NMPB, etc.) the department is in a position to help the students unravel the intricacies of plant life even at the molecular level. The department has been receiving extra mural funding from the various national funding agencies. Research projects worth over Rs. one crore are running in the department. The Department has completed some consultancy projects successfully. The department also houses herbarium focusing on the plant diversity of the Pir Panjal and surrounding areas. 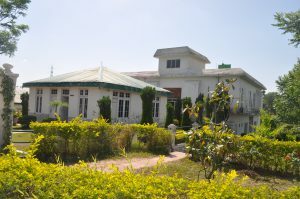 Lead Botanic Garden, Herbal Garden and fernery are the main attractions of the department.